In '97, the future of the Tower Theatre—now an iconic downtown performing arts and events center—hung in the balance. ike a comet returning every so often to renewed waves of interest, fear, and promise, the issue of downtown Bend's Tower Theater is, again, orbiting the community. Unlike a comet, however this point of hope may be coming in for a landing. Since Act III Theaters closed the Tower in 1993, the building and its future have been a source for as much hype as when the place first opened. Few will argue that the cultural air of Bend is, well, a bit rarified. The interest exists though. The recent success of the Robert Cray and Stanley Jordan shows prove that we may be slow but we are not dead. The Tower Theater, by virtue of its location and personality, offers the ideal venue to host the kinds of cultural events that other communities take for granted. And yet, perhaps the greatest asset of the Tower may lie in the less easily defined benefit of the Tower to attract people and their money to downtown Bend: a growing benefit in the coming era of continued commercial expansion east. Four years ago it seemed as if the Tower was doomed to be parceled out into soulless retail and commercial spaces, a plan that left the community at large feeling helpless to control its artistic destiny. To lose an icon of the downtown area was considered a tragedy to most Bendites, especially to those who remember fondly the old Pilot Butte Inn, destroyed in the name of progress before old buildings were considered valuable and of historic interest. The city of Bend purchased the property and postponed developing the space until the possibility of retaining the Tower as some kind of theater could be explored. In 1995 the city turned management of the Tower to the Regional Arts Council of Central Oregon (RACOCO) with the understanding that they would raise the money to renovate and then operate the theater. RACOCO seemed to be on the right track in the first year, hosting over 100 events and gathering the support of the community. But in truth, as Andy Parks of the City of Bend Administration Office stated, "RACOCO missed several deadlines and failed to make even one payment that I am aware to the city." By the time the city pulled the plug on RACOCO, it had become obvious that they had done little except please the public and lose a great deal of money. As if to add insult to injury, they even lost one of the city's big tents. It speaks volumes about the accounting and management practices of RACOCO, that nobody seems to know just how much money was lost or for that matter just what happened. The general consensus is that RACOCO story is "water under the bridge" and nobody connected to RACOCO will discuss the topic further, presumably for fear of tainting the new project. The city has now stated that if certain goals cannot be met they will reconsider their options, probably selling the property to recoup the estimated half million dollars it has sunk into the project. Although Parks allowed that the "city is open to proposals, and will not just let (the Tower) decay." fter the RACOCO fiasco, if this were any other building in town, that would be the whole story: "Organization Unable to Save Old Building," one paragraph buried in the depths of a community section behind the blurb on the parks department buying a new Cushman to haul shovels around the softball field. But it's not just any building. The Tower Theater is one of those rare buildings that define the character of the downtown. Buildings like the Tower used to be in every small town in America. In some towns, it's an ancient hardware, a drugstore, the old post office, or it is the one or two buildings that you always notice when you drive through a place. And almost without exception, the fortunate towns are those where a local theater is one of those landmarks. The old theater is (or perhaps used to be) a fixture in most small towns. These places were the cultural and economic center after 5 p.m. And as successes in Portland have shown, they still can be, even in this age of multiplexes and gallerias. Since the Tower came up for sale in 1993, the proposed uses have centered around three basic models. The first is to turn the theater into community performing arts center. The second would be to create a second-run movie house like the Baghdad or Mission Theaters in Portland. Unfortunately, former owner, Act III theaters, wrote into the deep a restrictive covenant that says, "for a period of 25 years... the property may not be used for the purpose of operating a motion picture theater or cinema." Sorry. The third option that nobody likes is to entertain the original plan of converting the building to office space. Most people agree that more office space is not what the downtown needs. The performing arts center option is now being championed by a group working under the name, "Friends of the Tower," and it appears to be the one most likely to succeed. Their goal, much like the goal of RACOCO, is, according to FoT board member Tom DeWolf, "to raise the $1.4 million to renovate the building and then to manage the facility as a non-profit foundation." DeWolf went on to say that they expect that "without the debt of renovation costs the operation of the Tower would pay for itself." With seating for just under 500 people, FoT hopes the Tower would play host to a diverse selection of events. Bend could have live theater and dinner theater, music from rock to jazz to classical—although the stage will be big enough for a 40 piece orchestra, no dance floor is figured into the plans—receptions, just about anything 500 people want to see. What FoT is up against is a 57 year old building that in its considerable history has witnessed just one remodel of note. In 1980, $100,00 was spent upgrading the theater; beyond that, the only improvements to grace the building have been new seats and some floor repair in 1969 and then some additional electrical work in 1987. One and a quarter million dollars may seem like a lot of money to spend, but when viewed as an investment it becomes more appealing. A National Endowment for the Arts study determined that every dollar spent on a local art scene returned $1.67 to the local merchants. If that figure is correct, Bend could look to $2.3 million in return. Perspective is important. $1.4 million—a lot of money to have on the kitchen table for sure—is a pittance in the world of real estate development, particularly when the government is involved. By comparison, a recent study by a national theater operator eyeing the chance to open a cinema here pegged their cost for a built-to-suit facility at nearly $4.5 million. But as DeWolf is quick to point out, "the focus of the Tower is not just movies." he level of support FoT enjoys is tremendous. Community leaders, business people, the city, the Bend Downtowners Association, just about everybody (including Win Francis who originally bought the property from Act III and then sold it to the city) has given 110% to making this project fly. But is all of this interest altruistic? If you talk to the Downtowners, "need" is not the issue. Ann Esau of the Downtowners was quick to the point, "Have you been downtown recently? Downtown is doing excellent." She seems to be right, according to a survey conducted by Compass Commercial Real Estate Services. 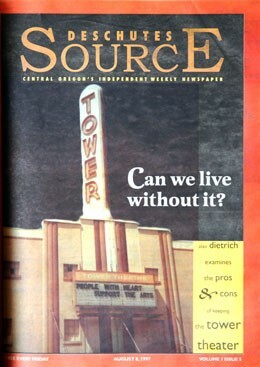 The first issue of the Source featured the iconic Tower Theatre on our cover. As of the first quarter '97, downtown was 89.9% occupied. And with merchants like Local Joe moving into the zone, the future only looks brighter. Esau added, "Two more antique stores are moving into downtown. There is the new library, the Boys and Girls Club, (in the old athletic club building), the Phoenix Inn (on Hospital Hill) and Downtown is historically the center of Bend." Indeed with Bend area businesses serving a community of 150,00 people and an additional 4.1 million tourists visiting the area, downtown's biggest concern should be adequate parking and wide enough sidewalks. But there is not a business owner downtown that is not keeping a nervous eye on the explosive growth outside of the downtown area. The concentration of such powerful national retailers as Pier One Imports, Blockbuster Video, and Barnes & Noble on the east edge of Bend make downtown's 10.1% vacancy rate (the highest of the three sub-markets says the same survey) seem a bit more ominous. Add this to the increased competition from the Old Mill site, and the Tower becomes more than just a neat idea. It may turn out to be the final ingredient that solidifies downtown's continued viability. It doesn't take much imagination to appreciate the beauty of a coherent downtown district sporting a mix of shopping, nightlife, the library, and if all goes well, a new performing arts center, all bounded by the river and Drake Park within walking distance of the Westside. The vision makes the urban congestion of the Highway 97 corridor less appealing, even if it will save you a few pennies. The Friends of the Tower have until the August 20 City Council meeting, says Kris Rees of FoT, "to meet the self-imposed stipulations of raising $300,000 in cash and in-kind donations and show strong community support for the theater." If these criteria are satisfied, the city will sign off on the proposal, and FoT can get to work on raising the remaining million or so dollars needed. Both Rees and DeWolf expect the money to come from any number of sources including regional and national charitable foundations, as well as the local community. Rees cited as an example of community support that "the Bend Downtowners have been very helpful, they doubled their pledge goal." DeWolf added, "If all goes according to plan we will be celebrating our grand opening New Year's Eve 2000." Downtown Bend may not need the Tower to survive now and our cultural desires may yet be fulfilled by a performing arts theater elsewhere, but what happens in a couple years when Bend's population is approaching 60,000? How many of the 30,000 new locals, when they live on the expanding Eastside, are going to drive past The Forum with Barnes & Noble, Pier One and Pilot Butte to cross Highway 97 and entertain themselves downtown? The Tower may not seem like a necessity at this time, but the question that is now asked about the Tower is, "Can the community afford to renovate and operate the theater?" Perhaps, Bend should ask, "Can it afford not to?"